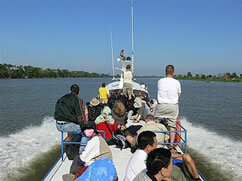 Cruise the Tonle Sap lake via a speed boat and go from either Siem Reap or Phnom Penh and on to Battambang. It takes around 5 – 6 hours for the trip. ※Limited departures and schedules. You can book via our Krorma Tour Desk offices and if there should be no schedule available, we can arrange the bus for you. *If we can get your accommodation details then the boat company provides for a free pick up if you are staying within its pick up zone. Outside of that area means you have to go to the station by yourself. 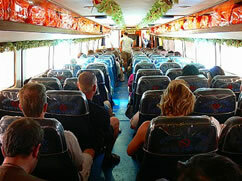 *The tour, depending on season may take more than 7 hours especially during the dry season. You might also encounter a wooden boat for this tour. •	A single person may avail of this tour. •	We will not be held responsible for any lag in schedule or boat problems during the tour.